The Exchange is managed by the The Culture Capital Exchange. 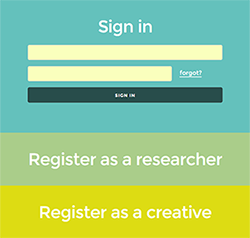 We have over ten years’ experience working at the intersection of research and the cultural and creative industries. Suzie joined LCACE, TCCE’s predecessor as Senior Manager in 2005. Her professional background encompasses Dance and Theatre management, a 5 year stint at Arts Council England as a Senior Officer and a secondment as a researcher to the DCMS Select Committee. Suzie is currently Chair of the Board of Directors of Jasmin Vardimon Dance Company, an international touring company, and Theatre Peckham, a young people’s arts project based on the North Peckham Estate. Evelyn joined LCACE, TCCE’s predecessor as Cultural Development Manager in 2005. Her background is in media and digital culture. She was previously Director of Lighthouse, Brighton, established one of the UK’s first networks for the then new technologies landscape and has curated many events, projects and collaborations. Evelyn is advisor to the Doctoral Training Centre in Media Arts Technologies at Queen Mary, UoL and is on Governing Council for Creativeworks London. Georgina joined TCCE in December 2012, after 13 years working in live event production for the broadcast media industry, dedicating many of those years to the running of the Sony Radio Academy Awards as Awards Manager. Neha joined TCCE in December 2014 from The Society of Authors where she was Prizes and Marketing Coordinator. She is responsible for compiling the monthly newsletter, overseeing social media and the website and providing administrative support. Enrico is a social entrepreneur, a performance-led researcher, and an internationally renowned performer, specialising in contemporary music and cross-media, technology-mediated performance. Founder of Conductive Music CIC, he specialises in contemporary music and in integrating cutting edge technology to boost public outreach and deliver employability skills to students from challenging backgrounds.